Those pumping wind and solar only ever talk about capacity, which is like being told that the cheque is in the mail. The kind of fantastic promise made by those who hope it never collides with reality. But, like the cheque that never arrives (and bounces when it does), promises that wind power delivers are not just hollow, they’re a delusion. Coal and nuclear power generation don’t need a second system like pumped hydro, mythical mega-batteries or prayers to Mother Nature in order to deliver power 24 x 365, whatever the weather. These are ‘systems’ and, by definition, systems work. 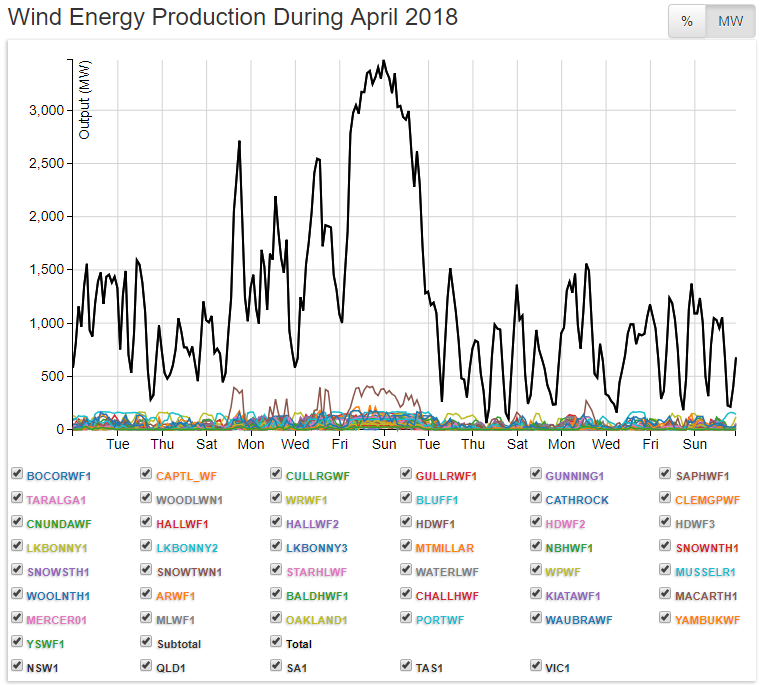 What’s depicted above is taken from Aneroid Energy and shows the entire output of every wind turbine located in Queensland, New South Wales, Victoria, Tasmania and South Australia connected to the Eastern Grid, with a combined notional capacity of 4,675 MW during April this year.